This seller’s fate lies in your hands, and your finger is feeling a bit twitchy. It feels like someone is always asking you to rate every consumer interaction in your life. Usually before you’ve had the actual experience. With over half a million available apps, each one lives or dies by how popular it is. 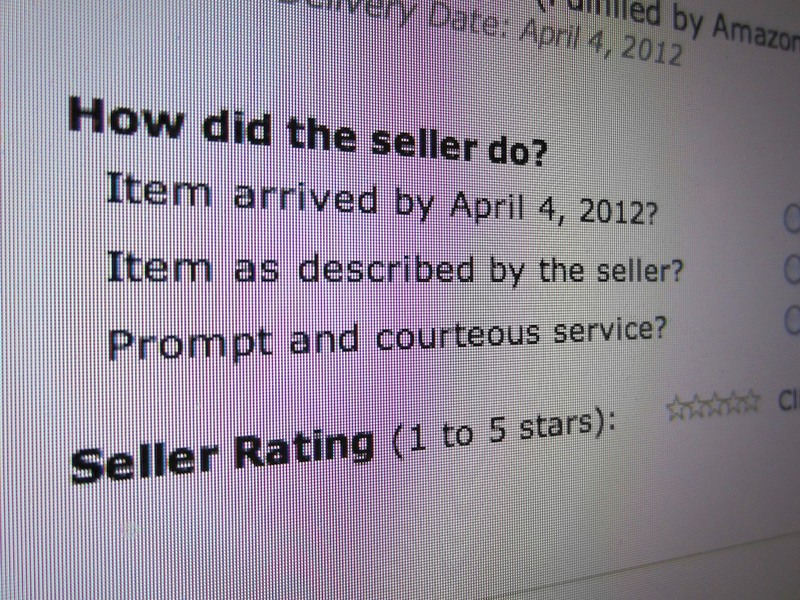 Amazon asks you to rate everything you buy from them. They send you an email, which contains an easy ‘excellent’ button to press. I’m not a regular reviewer on Amazon, at least not yet. But seriously, it just felt good. There’s a certain power to it. As suggested with the title of my previous blog post, (which references dialogue from the ending of the movie, Spider Man) you’ve got to exercise some level of responsibility when you influence/affect others. I think the social/moral mandate is clear when it comes to well-regarded ‘influencers.’ In the tech review world, there are a few sources I regularly check out. They cover a good selection of tech gadgets with a reliable team of reviewers. He writes for The New York Times and is also on CBS News Sunday Morning. Their selection of reviews is smaller, but it’s still worth checking out. This is the place for geeks to research any and all specs on new cameras. Not for the casual reader. But if you’re one of a million everymen and women with posted opinions, I think you’re not considering your journalistic integrity. You’re just letting it rip. Damn the torpedoes, full steam ahead! You’re an often-anonymous entity who could be a genius or a luddite crackpot. Without credentials, you can pretty say what you want with impunity. That’s the beauty of it all. So everyone’s got an opinion, and with the democratization of public communication via the web, everyone wants to share. And isn’t there some value to each and every one of them? The fact is, I simply won’t buy any home tech without first reading what others say about it. Beyond the pros, I spend plenty of time researching what ‘the tech commoners’ are saying. I find reviewers in all sorts of places like YouTube. Those raw reviews often show me the product up close and personal in ways that go beyond the typical professional review. Mid 20th century psychologists would call my information gathering process- informational conformity. Listening to the opinions of others leads you to your own conclusion. Often, it’s just a popular conclusion, which may or not be entirely accurate. But short of spending your entire waking day looking at every product out there, it’s all you’ve got. Yes, I’ve made up another little term, but I think it’s accurate. The irony of Tech Group Think is it’s actually hard to find consensus on how good any tech really is. It’s kind of complex, and you’re often left with lingering doubt after some heavy-duty research. It’s easy to simply freeze up with too many differing opinions and just do nothing for fear of making a mistake. At the very least, you’re feeling unsettled with whatever choice you do end up making. It’s like Vegas. Play the odds, be confident, and do your best. You’re never going to find a unanimous rating on anything. Somebody always hates something. But if there are lots of one stars popping up, start worrying and move on. Look, you’re not a lemming. You’ve got to trust someone. So go with the crowd. I say the good news here is much of Tech Group Think usually gets it right. It’s just a strong hunch, and I’m going with it! There’s no one path to successfully using Tech Group Think. You just need to personalize it in a way that works for you. And a lot of people do it every day! My wife is a perfect example. While I often struggle with the simplest tech purchasing decisions, she is out there gathering all the data on the web she needs to help her make some decisions of her own. She won’t go to a new restaurant before checking it out on Yelp. Before putting a vacation together, it’s Trip Advisor or bust. I should qualify that my wife isn’t spending time researching technology. Actually, her Tech Group Think is really just plain Group Think via tech. But it works out pretty well for her. And just about everyone else, it seems. Who’s really worrying about informational conformity, anyway?! Maybe they’re all onto something! …and it’s finally time for me to take the blue pill. For now, I think I’ll put my red pill aside and share the power of my painfully researched Tech with her effortlessly successful Group Think. I make lots of grunts hunting the right tech to bring home. She efficiently gathers knowledge via her tech links to the world. I call that the typical life of a 21st century family.